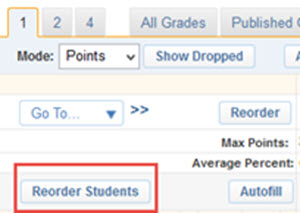 You can take control over the ordering of assignments and students alike through your Gradebook. Assignments are sorted by due date. You can choose how new assignments are ordered in your Gradebook - either to the right or left of the previous entry. Students can also be reorganized in your Gradebook. 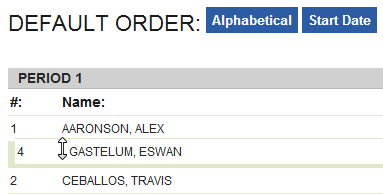 With a simple click you may set the default order as either alphabetical, chronological (by start date), or custom. Access your Gradebook via the School Loop portal homepage. Click Reorder Students on the left hand side above the students list. Click Alphabetical or Start Date, and click Submit. Use drag and drop to customize the order of your students. You can also use the Add new to right or Add new to left options to rearrange the students. Once submitted, you can revisit the Gradebook to view the alignment status.